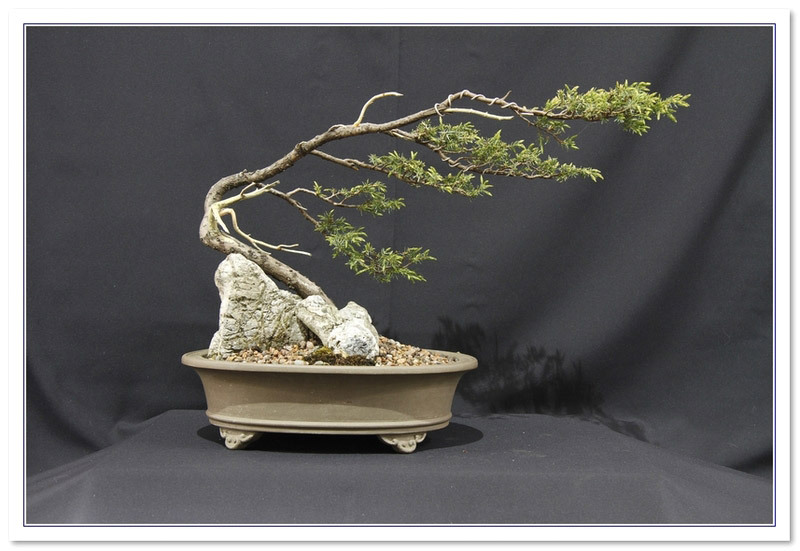 Challenging the Bonsai A to Z entry for Needle Juniper (Juniperus rigida). Small evergreen tree with arching branches and small, needle-like leaves which are flaccid when young but become sharp when mature. REPOT : Every 2-5 years in spring. After 10 years expect to repot every 5 years approximatly. SOIL : Free draining soil 60:40 grit:organic. The addition of some (20%) sphagnum moss provides added benefit. PRUNE : May be pruned any time but late summer is best when sap is not rising fast and likely to cause bleeding. Cut back vigorous extension shoots to 3 or 4 needles. PINCH : Pinch back growing tips with fingers continuously to mainatin shape and access to light. WATER : Water well in summer, but avoid waater logging. Keep moist but not wet during winter. FEED : Balanced feed at half strength in growing season. Two doses of nitrogen free fertilizer in early autumn. There are 819 entries in the A to Z and the pages have been viewed 3061082 times. Help us to increase the number of relevant bonsai terms included in this A to Z of Bonsai Terms. We include manufacturers and dealers in the dictionary, if you are one or know of one not mentioned then just click the link above and add an entry. If you have a favourite bonsai tree not mentioned just add an entry. We are trying to create a unique single free source for all bonsai terms and hope to capture worldwide bonsai terms for bonsai trees, bonsai clubs associations and national collections and the A to Z is free marketing for bonsai businesses and bonsai clubs.